When an exhibition is shown in two different places, it is often wise to see it in both as oftentimes the arrangement of the works varies so much depending on the size of the rooms. Whereas the Mellin retrospective at the Musee des Beaux-Arts de Nancy was beautiful and very interesting due to the subtle and refined staging produced by the architect and museographer Didier Blin, the one in Caen (which ended 31 December 2007) became in fact fascinating, perhaps more striking, again in the hands of the same person, due to the size of the galleries which required a new hang. The three large rooms here offered a better chronological understanding of the paintings by this “Lorraine native between Rome and Naples”. The opposition between The Young Man in Armor said to be Saint William of Aquitaine and the two Angels Bearing the Instruments of the Passion is very revealing : the first is a small masterpiece by Vouet (the beauty of the draped effect is to be admired), the second (the Angel with the Tunic and the Dice) seems to be by Vouet and his workshop (its execution is less masterly, the features too small), the third (the Angel Bearing the Lance) with the paint “overflowing” and the fingers a bit hooked is indeed by Mellin. The fact that Philippe Malgouyres was able to distinguish that the Angels from Naples were by different artists is remarkable. 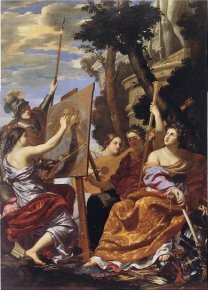 Working from there, he grouped together other “Vouet-like” paintings that he correctly ascribes to Mellin : Herodiade from Capodimonte (cat. 39) ; Jael from a private collection (cat. 38) and also Peace and the Arts (ill. 2) as well as Painting Drawing Love (cat. 59 ; ill. 1). As for the matter of seeing a Muti intervention in the painting from the Barberini palace, we would not be so sure. 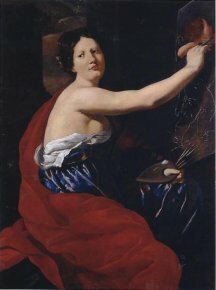 Just like Vouet evolves from a somber Caravaggesque style of painting towards a lighter, pre-Baroque manner, Mellin also progresses in the same direction (from the Angel at Capodimonte mentioned above to Saint Mary Magdalene at the Palazzo Barberini, cat. 46). His last major painting with a strong Vouet presence is of course Peace and the Arts. The question is the following : did the Muti brothers, studied earlier by Schleier, play a role in Mellin’s evolution towards a “Baroque” style ? Or was it they who were in fact the followers ? It is true they were active as painters : “Thanks to the Barberini inventories, it is possible to establish a real or supposed production by the Mutis. It is rather abundant, since in just a few years, between 1627 and 1631, at least six paintings, some of which are of a very large format, entered the Barberini collections. Two were by ‘the brother of the Muti knight’ : a Saint Sebastian (cf. cat. 66) and Peace and the Arts (cat. 5 ; ill. 2).” Philippe Malgouyres offers the museum-goer an acknowledged painting by the Mutis, Apollo (private collection, cat. 4) and sees in two of the larger aforementioned paintings (Peace and the Arts, The Rapture of Saint Urban I) a collaboration between the two artists (in the first : “its design is for the most part by the student and the execution entirely or partly by Mellin” ; in the second : “the types of faces are a bit different than those by Mellin and we think that this painting which also dates from a later period shows the strong presence of Giovanni Battista Muti’s hand” . When seeing the paintings again, we would be tempted to write : Peace and the Arts (ill. 2) is by Mellin while still under Vouet’s sway ; is it necessary to discuss the Mutis any further in this work ? On the other hand, in The Rapture of Saint Urban I, a Muti presence seems visible in some parts of the execution, especially in the two angels on the left. It is interesting to note that Erich Schleier, who discovered the Mutis (cf. his article in 1976 ) retreats somewhat in his excellent introductory text (“The Rapture of Saint Urban I is listed in the inventory….as a work by G.B.Muti when in fact it was probably painted almost entirely by Mellin” and for Apollo : “It would seem likely that Mellin worked practically alone when painting it” . Almost ten paintings were grouped together : Saint Francis of Paola at the Feet of Sixtus IV, musee de Rouen, cat. 12 ; The Assumption of the Virgin in Ponce, cat. 44 ; The Rapture of Saint Dominic in Viterbe, cat. 57 ; Saint Francis of Paola from the Musee lorrain in Nancy, cat. 11…The Vouet page has definitely been turned, the Muti interval is over, the references to Lanfranco, to Sacchi are more frequent ; small Poussin-like putti appear from one work to the next (Saint Francis of Paola, The Assumption but also in Painting Drawing Love, Venus and Love at her Bath from Berlin, cat. 36). The painting from Rouen stands out from the rest, half-way between Sacchi and Velazquez, a key work which is steadfastly “modern”. Another remarkable discovery by Malgouyres lies in the fact that he undermines D. Wild’s numerous attributions of Poussin-like paintings to Mellin. The Annunciation from the musee de Chantilly is definitively eliminated from his oeuvre thus establishing a major step forward. Only one truly Poussin-like painting was present at the exhibition, The Holy Family with Saint John, the former Aldecoa work (cat. 27, p. 152). Finally, the artist’s career in Naples is studied very thoroughly. Of the two Charity paintings (cat. 16 and 17), the one from Geneva (cat. 16) seems more beautiful to us. The Crowning of the Virgin (Rome, private collection, cat. 18), with its Sacchi, Camassei aspect is an artistic marvel, unlike the two “studies” (The Rapture of Saint Dominic and The Stoning of Saint Stephen, cat. 56 and cat. 51) which are much more disappointing. Saint Mary Magdalene (Rouen, private collection, p. 98-99) does not seem attributable to Claude Mellan. Portrait of a Man (Berlin Museum, cat. 61) ascribed to Mellin by Sylvain Laveissiere is, in our view, by Charles Mellin and we do not in any way agree with Pierre Rosenberg who sees here a work by someone from G. M. Crespi’s circle, although with an interrogation. Thus, the museum-goer is able to enjoy fascinating comparisons (Peace and the Arts, The Rapture of Saint Urban I, the Angels from Naples…), but there remains the enigmatic Saint Bartholomew (cat. 41 ; Compiegne, Musee national du Chateau) who has not yet had the last word. Philippe Malgouyres, Charles Mellin un Lorrain entre Rome and Naples, Somogy, Editions d’art, 2007, p. 71 and 84. Erich Schleier, « Charles Mellin and the marchesi Muti”, The Burlington Magazine, CXVIII, December 1976, p. 837-845. Erich Schleier, “Charles Mellin et les peintres actifs a Rome (1621-1634)” in the exhibition catalogue, op. cit. note 1, p. 20 and 16.